A Thousand Years of Indian Pictographs at Paint Rock. Solar and Stellar Observatories Still Work Centuries Later. Fred and Kay Campbell, owners of the ranch, are genial hosts and conduct the tours themselves and point out as many of the interesting pictographs as can be seen from ground level and explain the meanings of those that have explanations. Of course, you see more than ancient art, you also see the graffiti of a couple of hundred years of European-Americans writing their names. Even if these Indians could write, they would never have written their names on the rocks as they believed it was bad to ever again say the name of a person who has died as that would disturb their rest and their spirit would haunt you - that's one reason why much of Indian history has been lost. The winter solstice was very important to the people who lived here as they used that to mark the first moon of the new year and that is how they kept track of their seasons. There is a crevice in a nearby rock that casts a spear of light on an adjacent rock only on solstice and it strikes the ceenter of a painting only at local noon (about 12:45pm) on winter solstice. Actually it is a gradual thing and it gets closer to the center as solstice nears but strikes the center on solstice and after solstice has passed, it recedes further away from the painting. On the solstice we gather at the appropriate marker and wait for the ray of light and I play my flute for a while leading up to the event, a triumphant song during the event and a nice long closing song. They're not songs you've heard before, they're things I have made up, but the crowd loves them and I get lots of compliments and even a few requests for a CD. Who knows? one of these days I may record some of my flute music and make a recording available. It is unique. There are hundreds of paintings spread out over about a thousand feet - it's a great way to spend a day that you won't forget anytime soon. I also played the Choctaw cedar flute at the Winter Solstice of 2002 and Vernal Equinox of 2003 celebrations at the pictographs site at Paint Rock, Texas. Paint Rock is a place which many native peoples over the centuries have treated as a holy place and painted many symbols on the cliff walls above the banks of the Concho River. Observations have confirmed some of these rock paintings to accurately predict the solstices and equinoxes and some that appear to be astronomical/astrological sky charts as well. this does not sound like a commercial; it's not. Paint Rock is not for entertainment like a powwow, but is a special place where one can commune with nature and meditate in a place that lets you feel an uncommonly strong connectedness with Mother Earth and all her other children. It feels as if some part of the spirits of those who were here before are still here. It is an invitation to open the eyes and ears of your soul to hear the stories of those whose innumerable campfires dot the night sky and whose names can never be said again. One comes away with a feeling of spiritual fulfillment and personal contentment. There are some places that just seem to have some kind of spiritual electromagnetic attraction. This place is one and so is "the Garden of the Gods" rock formations in Colorado. 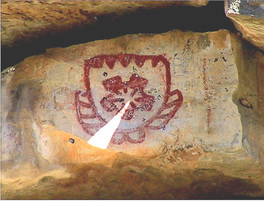 I have played my Choctaw cedar flute so many years at the Paint Rock Pictograph site during the winter solstice and looked at the other paintingsdiscovered the meanings of some of the other pictographs. Some of them were ritualistic, such as the paintings that honored the Green Corn Moon and the Ripe Corn Moon, two of the biggest celebrations of the year among corn growing Indians and perhaps a summer solstice marker. Some of them were of astronomical significance, such as those depicting the supernovae of 1054 and 1572 and one that was a beautiful map of the winter/spring sky. It's a real "Aha" moment when you finally figure out a pictograph. What was a mystery for centuries is suddenly clear and lucid. Sometimes such moments can be emotionally overpowering as you realize that someone from long ago left a written message on a wall and you just figured it out even though you don't speak the same language. That's the power of symbology. Sometimes it made me feel really giddy to finally figure out what was said in paint so long ago. It can be an emotionally overpowering moment - that was a surprise.